On occasion I read some grown up books that are sooo good I need to chat on about them in public. I wish this book was on every school syllabus. And not just because it is a story about the holocaust and WW2, but because it is the perfect example of how literature should be written: impeccably researched, infinitely compelling and thoroughly memorable. I’m not going to post my full review in this post for two reasons: Firstly, it’s long. And secondly, it’s really poorly written and does no justice. You know how every reviewer says “Oh I hate writing reviews about books that I love?”… yeah. Well, I’m saying that right now. Just trust me (and the millions of other people), if you have any interest in history, graphic novels or literature in general… read it. I mentioned a couple of weeks back that the wonderful Anna from Viking sent me a copy of MetaMaus, a book that provides an in-depth exploration into how Spiegelman created his masterpiece. I have to admit I was sceptical. Graphic Novel Fun Fact: Maus was the first graphic novel I ever read and anyone knows me and my reading tastes will know that I will defend the graphic novel to the death. So, needless to say, it made an impression on me. The book is split up into the three questions that Mr Spiegelman has been asked throughout his life. Spiegelman has such an easy way of combining hilarious anecdotes with fascinating historical background to provide an interview that is always compelling. From stories of his visit to Auschwitz, to how a Neo-Nazi ended up with a poster of Maus on his bedroom wall and how the idea of assigning each nationality with an animal came to him, Spiegelman, like his character in Maus, talks candidly about how he came to create one of the most memorable graphic novels ever written… or, um, drawn. I love how Spiegelman is never afraid to tell it how it is (a particular interesting part was the discussion about the pitfalls of creating a book/film about the Holocaust and how it can so often “risk the melodramatic trivialization of their suffering” or, as he puts it, “Holokitsch”) and he doesn’t worry about how his image will come across. As in Maus, he openly discusses the often difficult relationship he had with his father but how “it never occurred to [him] to try and create a heroic figure” in either his father or himself, which could have easily happened with a story like Maus. I think this honesty makes the original story so much more effective because it’s real. Every page is a visual treat. It sounds like a cliché… but I don’t care. It truly was. All through the book are examples of Speigelman’s original Maus sketches, photographs, unseen drawings, other artists illustrations and snippets of books, pamphlets and leaflets that he used for research. The book also comes with a disc of a digitalised version of the novel, complete with hyper-links, audio and the sketches of his original panel ideas. I spent a good few hours clicking through it and I know I didn’t even scratch the surface of what is included. This book is an absolute must for fans of Maus, fans of history and fans of graphic novels. I truly couldn’t recommend this more. The only slightly negative thing I had to say about it is that MetaMaus is best read with a copy of Maus in the other hand. But that isn’t a negative thing at all because I loved the opportunity to re-read it. But it did lead to the dilemma of which one to put down when I wanted a sip of my tea… because, honestly, I couldn’t decide between the two. 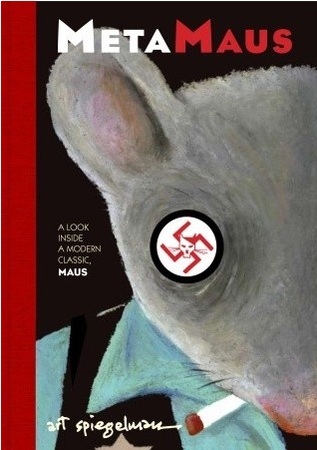 I didn’t think I could enjoy Maus more than I did… but it seems MetaMaus proved me wrong. Other books written during/set in WW11. The Book Thief by Markus Zusak || This has been marketed as both YA and adult… I read it thinking it was an adult book so that’s why I’m including it here. Anyway, it’s beautiful.. you should read it. NOW. Everything is Illuminated by Joseph Safran Foer || LOVED this book and the film is beautiful too. I need to do a re-read of this soon. Can you think of any that I’ve missed out? It makes me happy that you think so highly of MAUS because it is one of the books I may be reading for my English class :). It depends on what the professor decides, but if it's put to vote, I now know my pick!